Join Mick Gumshoe and Nova Shrewd as they hit the streets as the Super Sleuth Investigators! From solving crimes to ironing out misunderstanding, youll have to work hard to see if you can sleuth the mysteries before they do. The fun doesnt stop there! There are bonus puzzles such as, mazes, dot-to-dots, and code breakers to sharpen your sleuthing skills. 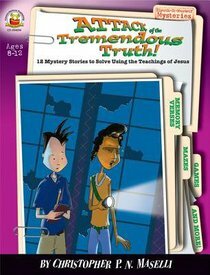 Great as a tool for Sunday schools, home educators, parents, or simply individual fun, the mysteries of the teachings of Jesus are unveiled in one humorous and intriguing adventure after another. Students can join super sleuths Mick Gumshoe and Nova Shrewd as they look for clues and discover that solutions to life's problems can be found in God's Word. Perfect for Sunday schools, Christian classrooms, clubs, and midweek, each of these 12 reproducible lessons include an activity, a memory verse, and open-ended questions that help kids put Biblical truths from the stories into practice! About "Sleuth It Yourself: Attack of the Tremendous Truth (Sleuth-it-yourself Mysteries Series)"